Warmer temperatures here in Arizona, means having picnic-worthy eats always ready to go! 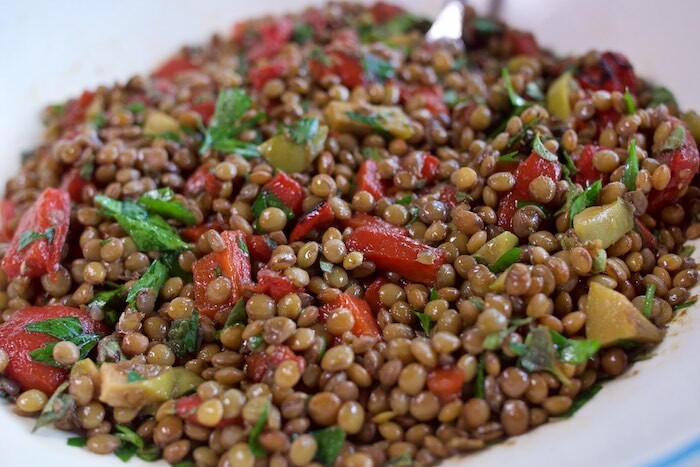 Lentil salad is a good choice to pack if you are planning a healthy picnic. It's delicious cold or at room temperature, it's easy to transport and pretty much indestructible. Though the salad tastes great right after being mixed, it gets even better over time. Just keep in mind that it will need a quick stir before serving. Place lentils in a pot with 3 cups water, bring to very low simmer, and let cook approximately 30 minutes or until lentils are soft. In the meantime whisk together the lemon juice, balsamic, and oil to make a dressing. Drain lentils, place in a bowl and toss with dressing mixture. Allow to marinate for at least 15 minutes. Add peppers and olives to lentils and toss to coat. Season with salt and pepper. Top salad with fresh herbs and serve room temperature or chill in the refrigerator until ready to eat. You've inspired me to make a lentil salad ASAP!! YUM! I have had lentils in a salad but never a whole lentil salad. Looks great! I've never had lentils as a salad before. Sounds filling! This looks delicious! So simple. Versatile. I can imagine that one could toss in veggies we have on hand.. asparagus.. green peas.. too.. Love this! I love the green olives and lemon juice in this, such nice contrasting flavors!